He has been called “the man who won’t say no,” and his resume is absolute proof of that moniker. 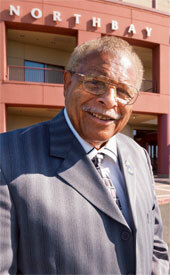 Garland Porter is perhaps one of the most visible members of the Solano County community, serving as he has for many years on an array of boards, commissions and committees. Yet, the organization that benefitted first from his time and attention here in Solano County – NorthBay – is the one he keeps returning to support, even after decades of public service. Garland’s military service took him away from the area, but he returned to Vacaville after retiring from the Air Force in 1972. It did not take him long to become involved in his new hometown, however. He helped co-found a local clinic and became a charter member of the fund-raising group that helped build VacaValley Hospital. Today, Garland is a member of the NorthBay Healthcare Foundation board, and has had “near perfect attendance” at all Solano Wine & Food Jubilees. The work he does for NorthBay is in addition to the many hours he devotes to other community organizations. He has been a long-time member of the Vacaville Chamber of Commerce, serving on several Chamber committees, its board of directors as well as its president. He has served on the Vacaville Commission on Aging, Solano County Armed Forces Committee, the Dixon May Fair board and Solano County Fair Association. He has also been president of the Kiwanis Club, and is currently treasurer for the city of Vacaville, a position he has held for more than eight years. And he was chair of Vacaville’s Tribute to Seniors.